Lamb Meal - Is an excellent source of protein & highly digestable. Gluten Free - made with Brown Rice, Milo & Oats. Coconut Oil - is part of the Medium Chain Triglycerides (MCT’s) family, for improved digestion & increased energy. Alfalfa - is a good source of Vitamin (C, A, K) and has antioxidant effects which many support the immune system. 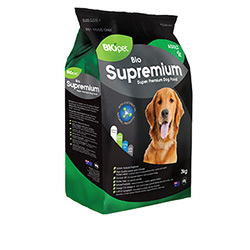 Lamb Meal, Chicken Meal (natural source of glucosamine), brown rice, wholegrain milo and oats, poultry oil, fish meal, coconut oil, fish oil, canola oil, natural yeast cell prebiotic, beet pulp, flaxseed, alfalfa, sea salt, dried kelp, rosemary extract, lysine, methionine, blueberries, potassium chloride, yucca extract, vitamins (A, D3, E, K, B1, B2, B6, B12, niacin, pantothenic acid, choline, folic acid), minerals (copper, iron, manganese, cobalt, zinc, selenium, iodine), lutein, garlic, kelp.